Just a drop of lavender on your pillow at night will help you sleep well – right? No, sorry, it’s not as simple as that. Essential oils can definitely help you relax and adjust your weird sleep patterns, but you’ll have to do a bit more work than opening an oil bottle. Read on to find the best essential oils for sleep, and what you need to change……. The classic sleep and relaxation oil, lavender is a healing herb that’s been around for centuries. This is a panacea (helps everything) in my opinion. The art of aromatherapy comes into play here as too much lavender can be too stimulating, so the key is to mix your oils to get a perfect soothing combination. Sometimes referred to as “The Oil of Tranquility”, vetiver is a very strong oil and you’ll only need a couple of drops in each blend. It is a cooling oil and very grounding and centering. Great for meditation and stress. Another ancient herb, marjoram will help induce relaxation and works wonderfully with its sister, lavender. Marjoram is an oil to treat pain relief, grief and anguish, so is perfect to help you turn off the events of the day, and the anxiety of tomorrow. Frankincense is the oil to help you take deeper, slower breaths. By breathing deeply you will automatically slow your heart rate, calm your mind and allow yourself to “be”. This is a classic oil for meditation and asthma. Bergamot is not a classic sleep oil, but it’s a lovely oil to help with anxiety, and mixed with some other oils, can add some sweetness to your blend. In fact all the citrus oils (lemon, lime, mandarin, orange, grapefruit) are light and blend well with most other oils so are always handy to have nearby. They will add happiness and lightness to your blends. Both these oils are relaxing oils. German chamomile is blue due to a chemical change during distilling, and is an anti-inflammatory oil for the body. It works synergistically with lavender in this regard. The scent is not as pretty as Roman chamomile, which has a honey sweetness to it, and could be better for you to use for this reason. Why not double up and have a relaxing chamomile tea in the hour before bed too? I regard Indian (Mysore) sandalwood as a sleep inducing oil due to its traditional uses, and it’s powerful energetic presence. This oil has many uses for the body but excels when treating the mind and emotions. It is a beautiful and expensive oil to use, but when it comes to sleep I’d say it’s worth buying a bottle. It will cover you in a comforting, soft yet strong, blanket of love. Other woods could be used in its place and I’d recommend cedarwood Virginian (which is actually a juniper, not a true cedar). Australian sandalwood could be a bit too stimulating with its hint of the hot Australian bush. In a traditional oil burner with a candle or a diffuser add 25 drops of oil, which could be too much for some diffusers, so check the recommendation of each unit and adjust thee recipes accordingly. I’ve got these gorgeous chamomile flowers in a teapot nest to my bed – sweet dreams! By now you have the idea so go for it! Mix those oils baby! Free Ebooks, Meditations and More! There are loads of FREE ebooks, meditations and courses from all kinds of spiritual entrepreneurs in this big giveaway – and it only lasts until September 30th 2015! Over 500 healers, coaches, light workers, body workers, and intuitive therapists alike have joined together to offer free gifts. You can download just one, or as many as you like. If you click this link, you will be taken to the sign up page, and then into the free marketplace. The first few pages are special offers but you DO NOT have to buy them. There are further special offers on courses and books that do require payment, but everything is optional. You don’t have to spend a cent if you don’t want to. 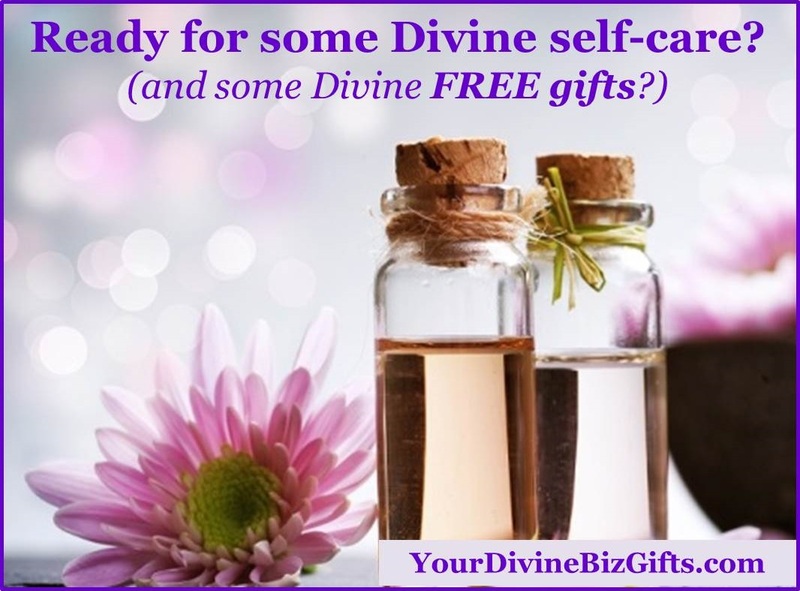 I hope you find something fun in Your Divine Biz Gifts, which was started by a business coach for spiritual workers to come together in numbers, and offer support to each other, as well as learn how to work in a smarter way. I hope you find something interesting!